Union Minister Piyush Goyal on 13 December questioned when the Congress would free itself from corruption. Addressing a press conference here, Goyal made these remarks after a court here found former Jharkhand Chief Minister Madhu Koda guilty in coal block allocation scam. "The way Prime Minister Narendra Modi led National Democratic Alliance (NDA) government has taken action against terrorism it has given a message that India doesn't tolerate terrorism. On the other hand, the tough measures against corruption have given a warning to the corrupt and paved the way for the country to move on the path of honesty," Goyal said. He said on the other hand one after another misdeeds of the Congress are coming to fore. "Today, a court has found former Jharkhand Chief Minister Madhu Koda guilty in coal block allocation scam, whose government was supported by the Congress. This once again proves that how then Congress led Union government and the state governments with the support of Congress were functioning. We all know that Madhu Koda was an independent MLA and how Congress leader Ahmed Patel had helped him to become the Chief Minister. 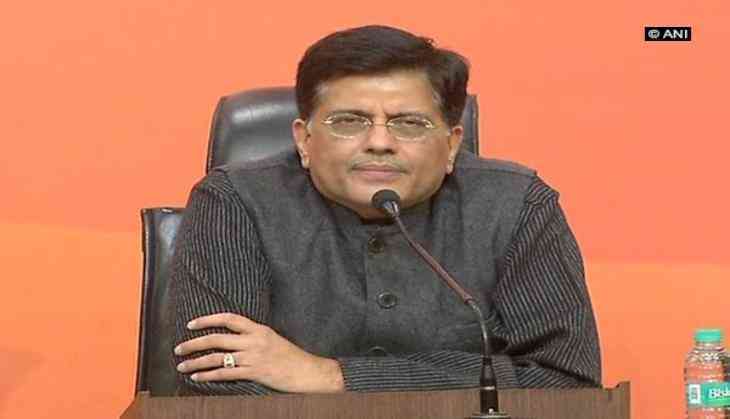 Koda government was being run from Delhi by the Congress leaders," Goyal said. He demanded an answer from the Congress over it. Goyal also pointed out arrest of a former Congress MLA from Delhi to corner the opposition party. "A former three-time Congress MLA Rajesh Jain from Delhi, who was arrested last month, routed and laundered huge amount of black money post demonetisation. Jain had close relations with many senior Congress leaders and it shows why the Congress opposed demonetisation," Goyal said. He demanded the people of country would like to know when Congress and its leaders free them from corruption and black money.